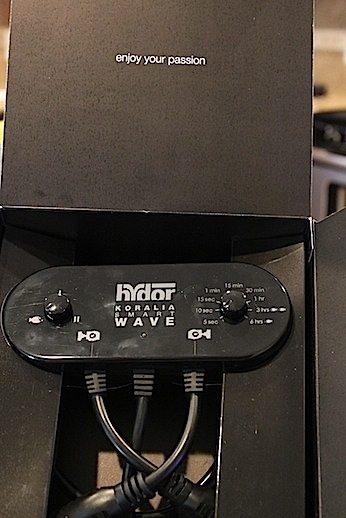 We spied the Hydor Smart Wave at MACNA last month, and now we’ve finally got the chance to get a little more personal with the pump controller. 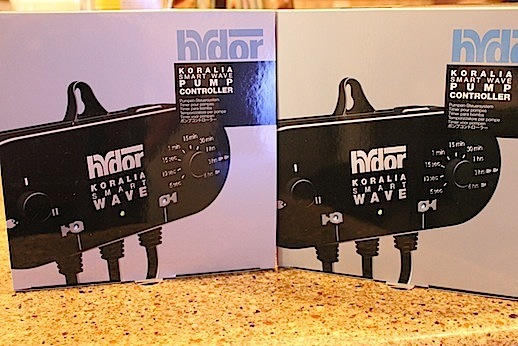 Hydor sent over a pair of the controllers, along with some Koralia Evolution pumps for us to try out, and our initial impressions are very good. Right out of the box, the Smart Wave is ready to go. Setting up the controller and pumps took less than 2 minutes, and we had two pumps pulsing back and forth in one of our aquariums in no time. Users can select between three different modes, with the pumps either acting in synchronized fashion, alternating back and forth, or turned completely off during feeding. The pulse duration can be set anywhere between 5 seconds and 6 hours. Some hobbyists might be disappointed with the fact that there is no quick pulsing back and forth like the pumps you see on the net, but we are actually pleased that Hydor took this route as the reef currents don’t pulse in short, rapid bursts but rather in a slower and more gentle back and forth fashion. Upon opening the box, hobbyists are greeted with an all too fitting message…”enjoy your passion”. 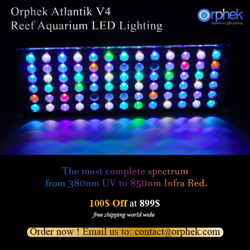 I cannot reiterate that message enough, as it is easy to get bored with aquariums or simply go through the motions of having a saltwater or reef aquarium. Digging a little deeper into the package, users find the controller and a very easy to follow instruction manual. In all honesty though, the manual probably won’t be needed because the controller is just so easy to setup. But, it is there for your convenience and it makes for great reference material and offers a few configurations that you may not have thought of. Once out of the box, setting up the pumps and controller was a simple as plugging everything in and flipping the power switch. Nothing difficult to program, no confusing user interfaces. Just simple knobs that can be turned to a desired setting. The Koralia powerheads come to live instantly and pulse to the desired time interval. The LED indicators show which pump is turned on and which one is off regardless of what setting the pumps are on. Another cool feature about the Smart Wave is the fact that each of the too channels can support a huge number of pumps. The only limitation is the watts being pushed through the controller. 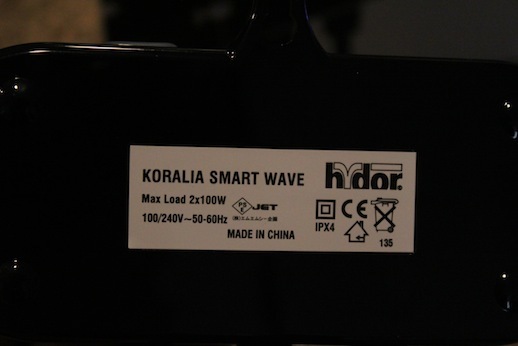 Each channel can support up to 100watts, and with the Koralia Evolution 1050 only using about 5watts each, roughly 20 pumps can be placed on one channel alone. Of course, this would require a standard household power strip to accommodate to all of the additional plugs. As for the pumps themselves, we saw no startup issues or propeller clicking whatsoever. You can hear the pumps pulsing slightly, but that’s really only if you are listening for them in an already silent room. With all of the other equipment your aquarium will be running, these pumps will not be heard. On top of that, they can move some serious water, pulsing or not. 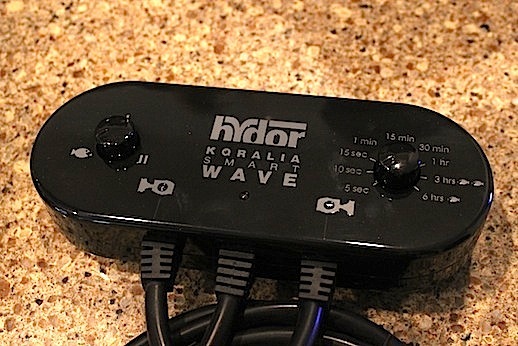 We are greatly looking forward to this review of the Hydor Smart Wave, and we’ll be posting videos on how to use the system, as well as how well it works on our aquariums. Was the pulse 100% on and 100% off with a full pump start up on each cycle? That would work well form my display Tank. I have powerheads in my aquascape to eliminate dead spot in my aquarium. Instead of running only at night, kicking on every 30 min may work better.